As the exalted ruler of the Kingdom of Base, the president loves patriotic displays of empty loyalties. This mighty procession from the White Guy House schedule has already given us his ceremonial plans to celebrate his vast accomplishments to make America great again as he crusades as the parade marshal on a long journey through the Old South to the Midwestern wheat fields and the distant Rockies. Trump is said to have asked the planners,”How did Hannibal manage to cross the Alps with his 40 elephants?” All the way to the 2020 election, the air will be filled with the glorious sound of a Dixieland band in the bayous and a five-string banjo Flatt & Scruggs rendition of the National Anthem in the ranches of the Far West. Eventually heading east, Trump, who told us he was elected mayor of Pittsburgh, will arrive with tales of how he revived the steel industry in the once-Smokey City and then rambled into the West Virginia “hollers” with a vision of taming black lung disease with the opening of a modern filtered coal mine at his promised lush resort at Cooper’s Rocks. 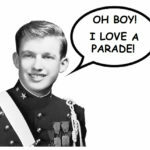 The historic parade will vibrantly capture the Trump culture. It will feature 25 farm tractors, 42 motorcycles, separate floats each honoring a cabinet member, repeated flyovers by Scott Pruitt in first class, and triumphal displays of assault weapons and missile launchers. One boxcar size float will bear a huge aquarium of clear, uninhabited water labeled the Swamp. At the Washington Monument, he will announce the greatest glass and steel project of any president in history – a fully American-built office tower, making allowances for undocumented Polish workers, exceeding the height of any monument on the planet. To the cheering masses, he will scorn the media for under-reporting its size. Fair warning. Strike up the band!